Goals fall into these five key categories. 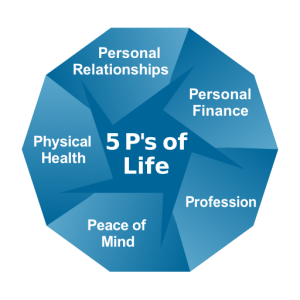 During different stages of life, some categories have a higher priority than others. TransitionPG® takes time to understand your needs and help you identify your priority goals. This category includes your relationships with others, including your significant other, parents, other family members and friends. This category focuses on your daily financial management and setting financial goals for the next five years and for retirement. This category addresses all issues involving your work, from increasing your sales to career management. This category focuses on your relationship with yourself – how to simplify life, decompress, and do what is truly meaningful to you. This category focuses on your overall physical health.